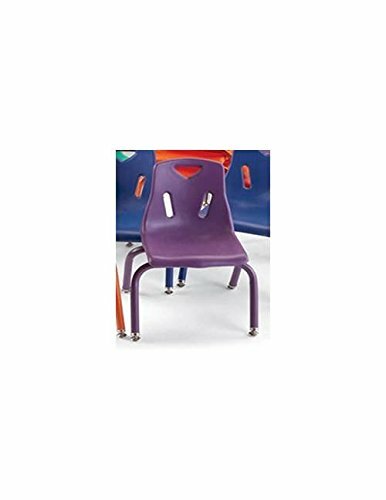 Jonti-Craft Berries Plastic Kids Chair w Powder Coated Legs in Purple (14 in. H - Purple) by Jonti-Craft at Indsight. MPN: 8124jc1004. Hurry! Limited time offer. Offer valid only while supplies last. Child-friendly design. Promotes seating comfort, durability and attractive styling. Nylon glides reduce noise. Polypropylene shell E-Z to clean. Child-friendly design. Promotes seating comfort, durability and attractive styling. Nylon glides reduce noise. Polypropylene shell E-Z to clean. Prevents blushing and dissipates annoying static electricity. Non-exposed rivets prevent snags. Greenguard Children & Schools SM indoor air quality Certified. Five year warranty. Made from heavy gauge steel frame. Made in USA. 16.5 in. W x 13.5 in. D x 19.5 in. H (7 lbs. ).